When the Irish Boy Scouts came into being in 1908 it was largely composed of the Protestant fraternity and although there were a good many Catholic boys in the movement it was viewed by many nationalists as a means of preparing Irish boys to fight for King and Empire. To counteract this Countess Markevitz formed the National Boy Scouts - Na Fianna Eireann in 1909. Extract from an address to the boys of Ireland - under the heading National Boy Scouts: "The object of Na Fianna Éireann is to train the boys of Ireland to fight Ireland's battle when they are men. Our Programme includes every element of a military training. We are not mere 'Boy Scouts', although we learn and practice the art of scouting. 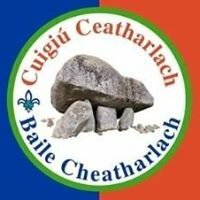 The Fianna will constitute what the old Irish called the Macradh, or Boy Troop, of the Volunteers, and will corre­spond to what is called in France 'an Ecole Polythecnique' or Military School." In 1913, Rev. Brother McKenna Christian Brothers Academy, with assistance from Rev. Brother Foran and Rev. T. H. Burbage B.D., D.C.L. (President) started a branch of the National Boy Scouts in Carlow. The Carlow National Boy scouts were regular participants at every Irish-Ireland Meeting, Rally, Demonstration, Feis, Sports etc., for several years, and were acclaimed for their Warpipers Band. This Pipe Band was in later years to evolve into the Carlow Pipers Band. The Civil War was to set the stage for the decline of the National Boy Scouts, or as they came to be called Fianna Éireann Boy Scouts, this was due to their political stance i.e. Anti-Free State. The Carlow Pipers were to continue to march beneath the old banner, a magnificent flag with a sunburst design, now in the County Museum, Carlow town. The flag was designed by Brother McKenna and painted by a Mr. P. Donohue who had a painting business in Dublin Street. The flag was displayed in his shop prior to its presentation and blessing. Hanging not too far away from the Na Fianna Éireann Banner is the original banner of the 1st Carlow Troop of the Assumption Catholic Boy Scouts of Ireland, (C.B.S.I.). It too has a sunburst design and was a very heavy flag to carry, with lots of embroidery and brocade. This troop was formed in 1929 two years after the formation of C.B.S.I. The founders of the 1st Carlow were Jack Gil trap, a Scoutmaster from Dublin, Rev. Brother Foran (the same of National Boy Scout involvement) and the Rev. Dr. Miller, who was also involved in the National Boy Scouts. It was very appropriate that the first troop of C.B.S.I. Scouts in the Diocese of Kildare and Leighlin should have been started in Carlow town as this is the Bishop's own parish. The two colours chosen for the troop were Sky Blue and White, which, in black and white photos, looks all white. No sooner had the troop been established that the officers were off helping to start up other troops. The 2nd Carlow in Graiguecullen considered themselves to be the first C.B.S.I. troop in Leix!! Then the 1st and 2nd Carlow helped establish Bagenalstown; the 1st went on to Borris (always by bike) and camped overnight for Whit Weekend. On Sunday, Liam Trundle, who was Scoutmaster of the 1st at this time, was first of all given the "third degree" by the P.P. on the aims of Catholic Scouting and then invited to address the congregation after Mass to explain what scouting was about, and answer any questions arising. Liam tells me he sweated blood standing on that chair outside the Church (Politicians of the period and long after did the same). His efforts were successful and a troop was formed. But not always was he received with open arms. The P.P. in Castledermot refused to entertain scouting, convinced it was a militarist movement. Naas was another success, though it took a bit of fast talking on Liam's part. But scouting is not all about hiking, camping, map reading, wide games, camp fires, observing nature, exploring and a host of other activities; it is also about being part of the community, of involvement in other organisations, sports, civic Scout leaders find rugby an ideal pastime as it is played during the winter months (usually in the rain) when short nights, inclement weather and so forth make it a little difficult to partake of outdoor pursuits, though many camps and hikes do take place in winter. The Thirties were a time of many religious events. Just to name a few, the Eucharistic congress in 1932 to which Carlow sent a fully trained first-aid team (consisting of S.M. Wm. Trundle, A.S. Master T. Croughan, P.L. Johnny Harding, P.L. Paddy Bergin, P.L. J. Kearns, A.P.L. Peter McEvoy, A.P.L. A. Cooper, A.P.L. J. Phelan, A.P.L. Jimmy Dunne, Scouts, Peadar O'Neill, Lar Reddy, Jos. Hewitt, Dennis Mulrooney, James Nolan, Kevin Murray, J. Whelan, M. Moore, Paddy Haughney, Pierce Donohue, Seamus Hayden) was to be a showcase for scouting and in every photo taken of the congress, are to be seen scouts on duty. There were also annual scout pilgrimages to the Shrine of Blessed Oliver Plunkett and many others. During the Forties there were many combined parades, scouts, L.D.F., L.S.F., Fire Brigade, Red Cross etc. All "Stepped Together" and there was also "Step Together" sports. Many new troops came into existence at this time - namely Ardattin, The 4th Carlow Assumption, The 5th Carlow Graiguecullen, The 3rd Laois, St. Fintans, 4th Laois, St. Patricks, (Both in Mountrath) 4th Wicklow, Baltinglass. The Knights Errant were formed at this time as was a Wolf Cub pack. The 1st Carlow brought out its own weekly magazine in this period called "The Cross and Shamrock." They carried out correspondence with a French troop and of course listened to "The Voice of International Scouting' on Radio Luxembourg. In the Mid Forties the scouts revived the Pipe Band and the Carlow Pipers were on the march again. In 1950 Scouting in Carlow / Graiguecullen became dormant due in part to immigration, when "Many Young Men of Twenty said Goodbye." Na Fianna Eireann were active during these decades also and some towns, notably Tullow, had a very active Sluadh, as did Carlow from time to time. In 1953 on 8th January scouting came alive again under Johnny Callinan as S.M. with Paddy Brophy, Tony O'Hanlon and Tony Kirwan as A.S.Ms. Tony Kirwan had for a time Pipe Major of the Carlow Pipers Band. In fact most on its members were ex-scouts. A meeting took place on January 8th, 1953 and since then troop scouting in Carlow has gone from strength to strength. Also in 1953 Dame Leslie Watley director of World Association guides visited Carlow. One of the biggest headaches of all Scout Troops is the poor availability of a meeting place; in fact in 1957 we were meeting at various times in the Town Hall, the old school and the bicycle shed at Bishop Foley School. The troop was very close to extinction for this lack of a permanent meeting place. We were very fortu­nate in 1958 to be given two rooms by Muintir na Tire in their Guild Hall in John Street, where we established our Den for five years. In 1962 we returned to the old school and it was here that the 5th Carlow Troop of the Assumption was founded, creating the 1st Carlow unit of the Assumption, incorporating 1st and 5th Carlow Troops. In 1965 the biggest project ever to be undertaken by a scout troop was launched. The building of a Scout Den. The Building is a log cabin type and was opened and blessed in 1967. During this time the 1st had amalgamated with the 5th and would remain as the 5th Carlow Troop of the Assumption for a number of years until the unit was revived in 1968 with the addition of two cub packs. The sixties saw the introduction of a new handbook for scouts as well as long trousers and shirts for the Federation of Irish Scouts Association. The information contained within the pages of this web site is provided solely for the purpose of sharing with others researching their ancestors in Ireland.